On our recent trip to Robinsons Magnolia, we saw this newly opened Thai Resto at the Foodcourt Level of the mall. This was near Gong Cha so its not really hard to miss. The decoration or overall look of the restaurant is just too minimalist. They can still do something to make the place livelier and happier. 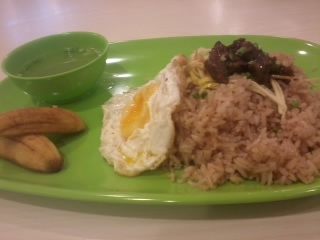 Binagoongan Rice Meal. Costs P110.00 only. Inclusive of iced tea. Very flavorful except that I can count the few pieces of pork. This was daughter's order but she didn't like it so I get to eat it. Yum! 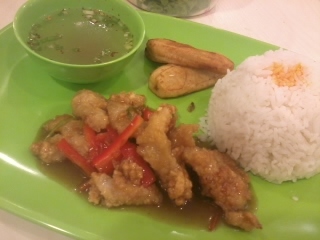 Also, the fried banana (saba) was not that oily. Two thumbs up! The soup ... hmmmm .... nevermind. Fish Fillet Meal with iced tea. Hubby ordered this. Had a bite of the fish and it tasted like dory. But who's complaining? The meal costs P99.00 so it can't be salmon or tuna, hehehe. Hubby enjoyed this but he still felt hungry. Compared to our orders (see other photos), his had only a cupful of rice while ours had more than a cupful. In other words, bitin! Pork Fried Rice. 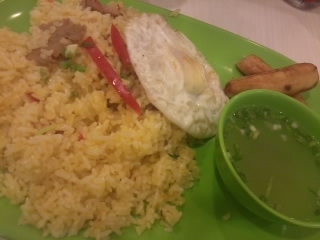 You can opt for Chicken Fried Rice and it still costs the same- P90.00. Inclusive of drinks also. Tastes so-so. But daughter said its ok since she didn't like the binagoongan rice meal. And if I complained about the few pieces of pork from the binagoongan rice meal, this one had lesser pieces. Really. But we're still happy campers since we got two hits vs three. Also, this is part of the Thai Bistro, a much more pricier restaurant, also located at Robinsons Magnolia, upper ground Alfresco area.